There’s a new work in progress sitting on my easel. By the time I’m done with this post, it’ll probably be a finished work. It’s another kestrel, and I’ve reached a reliable stage in the process. I call it the ‘Panic Stage’. The photo above, by Terry Stanfill, is the one that served as the model for my painting. In the end, it didn’t look exactly like it, but I think it’s close enough and the differences are not necessarily bad ones. When I first start a painting, I start out with a sense of excitement. I can’t wait to see the finished image. But usually there’s a whole lotta grief and misery to get through before I reach that point. What is the Panic Stage? I imagine there’s a point like this in the process of any kind of creative act. It’s when all seems lost, like you just cannot do the thing you set out to do and it feels pointless to continue. There is most certainly a panic stage with natural childbirth – at least there was in my own three experiences and also with the the birth of my grandchildren. Any act of creation, whether it’s visual art, hand-crafted, or written is like a symbolic giving of birth. In the real act, the panic stage occurs just before it’s time to start the first real push. It’s when the mother in labor wants to quit the natural way and wishes she’d opted for the pain-killing epidural. Because it hurts. And it’s hard. And there seems to be no realistic way to achieve the birthing without dying in the process. That’s the panic stage. Of course, it’s not so dramatic when it comes to creative birthings, but some of the emotions are pretty close, ha. 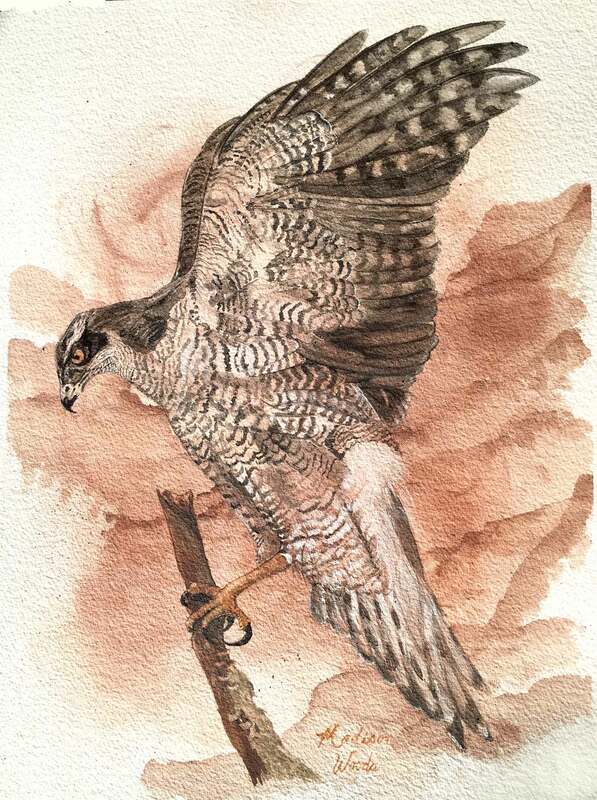 And when it comes to my kestrel paintings, it seems I have to push through a point where I want to throw it away in every one. Thankfully, I have a lot of encouragement from friends and family to talk me down from the ledge when I hit that point. I just hope this sort of thing eases some as I get more experience. I take photos of the various stages of my work because it helps me to look at it with a different perspective. What I hope is that one day I’ll see the problems soon enough during the creation of the work that I can fix them early on and avoid the panic stage all together. Once the background is applied and the light sketch drawn in, the eye is the first thing I have to paint. If I can’t get the eye right (position, size, expression), none of the rest of it will matter and I’ll avoid the panic stage at the end altogether, ha. It at least has to be set up to a point where I know I can make it work. Sometimes something is wrong and I can’t figure out what it is. In the photo above, I know the eye and the nose are going to need some work, but it’s there well enough that I also know I can fix the problems. So this doesn’t bother me. They are at least done to a point where I am confident that going forward won’t be a waste of time. Seeing the photo on Instagram or Facebook lets me see it as if I am looking at it for the first time. Lots of things aren’t always evident at the start. Sometimes it’s not until I start working on a certain part that I realize the off-thing in another part has thrown off this part too. Often I can tell right away when I see it in a photo I’ve posted what the problem is. It’s when I can’t see what the problem is that the panic stage really starts to set in. An angle might be off. A line might be curved where it should be straight. Both of these issues occurred in this particular painting, and they often happen when I am drawing or painting anything. The key is to be able to see it and make the necessary changes. And that’s where the progress pictures come in really handy to me as the creator. It is still looking good to me at this point. I haven’t seen the problem yet. I like sharing them publicly so that if anyone else is out there trying to create something, they will see the agony another artist goes through during the process and not be so afraid when they encounter their own sense of dread halfway through it. But I also like getting the feedback and encouragement my friends offer while I’m in the middle of a creation. It motivates me to continue. It’s also good for marketing. People love to see what went into something they might be interested in buying. I know I do. Right now, kestrel #3 is at that awkward stage. The spot where nothing looks right and I question whether or not I should just wad the page up and throw it in the garbage. It’s not the Panic Stage still, because I haven’t tried to fix anything and failed yet. I just know something’s wrong. It’s the tail. The tail is slightly off in the angle, making all of the other lines wrong on it when I try to add the feathers. It’s the angle of the tail. So I erased the tail and started over on it. Three times! Finally, the tail looks like it should and I am happy and can move on. Panic stage eased somewhat. He’s ruffled in the wind, but there’s something else wrong. But now I can see that there is a line issue with the wing tips. It needs to be straight, not curved. And I can fix this now that I recognize the problem. Until I saw the picture in another way, on the progress pic I posted, I didn’t see the problem but I had been fighting a disturbing sense that something was not right. Once the wings were fixed, I noticed the barring on the back was all wrong.The lines were traveling the wrong angles. I’d also gotten too heavy handed with the black, and there was too much black. Everywhere. The average person might not have noticed the misguided bars or the fact that I used too much black, but if someone really loves kestrels, this is something they would have noticed. So I picked up all the color from the upper back. Then I had to pick up the color from the middle wing. And I had to remove some of the black around his eye. Then I had to replace some of the black that made up his eye, lol. I was really entrenched in panic stage by this point, let me tell you. When I finally got it all repainted, it was much better and worth all the effort. I’m past the panic stage now, but there are still issues to fix going forward. I know what I need to do, though, and that makes all the difference in the world. When have you ever experienced this sort of dismay? When you hit a panic stage do you quit, or do you push through? How long does it take to overcome the feeling that you’ve just wasted your time and resources to get to that point? Thankfully, this phase is usually short-lived for me if I am able to keep working and I don’t quit. I’m quite pleased with it now that all the grief is over. I’m also glad I didn’t quit when the work of it got tough. 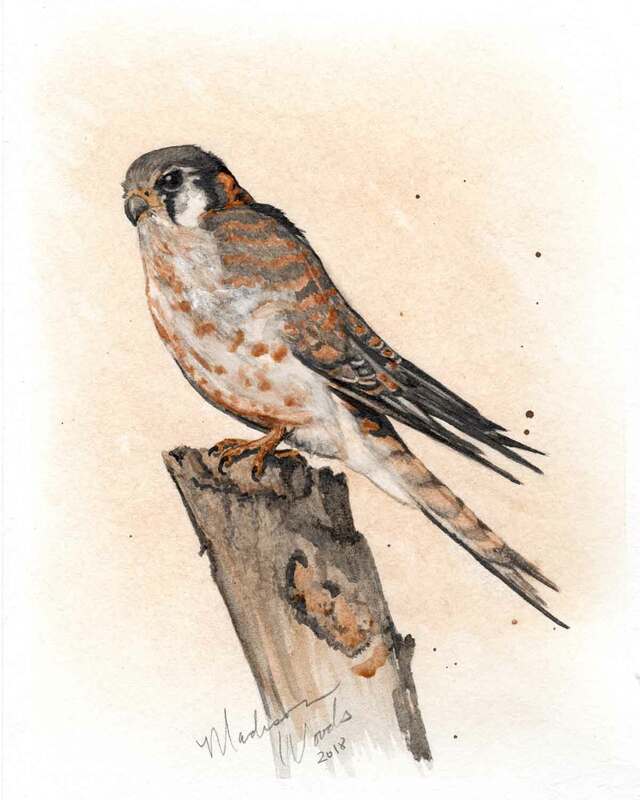 Soon this little kestrel will be on her way to a new home on the west coast. Here’s the photo I used as a model. Kestrel photo by Terry Stanfill. Used with permission. Here’s another of my other posts with progression photos. I’ll try to begin adding a progression post with every painting or work I do going forward.